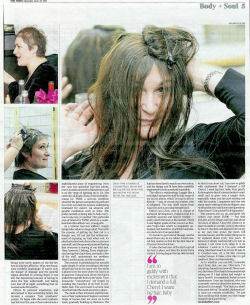 Sarah Vine’s hair started thinning when she was only 13, by 44 she was balding and decided she had to do something. 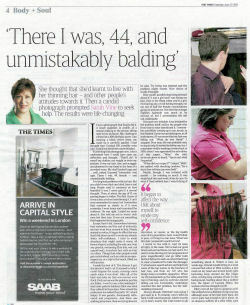 She thought that she’d learnt to live with her thinning hair - and other people’s attitudes towards it. Then a candid photograph prompted Sarah Vine to seek help. The results were life changing. It was a photograph that finally did it. A small snapshot, in profile, of a woman talking to the person sitting next to her at dinner. Me, chatting to a friend at a 40th birthday party. I am wearing a black velvet dress, my make-up is carefully applied. I had thought that I looked OK, possibly even nice. I could not have been more deluded. Examining that photograph now, I don’t understand how I could have seen my reflection and thought, “That’ll do”. It wasn’t my clothes, my weight or even my posture; it was my hair, thin and scraggly and plastered to my head in the heat of a crowded room. My skull looked huge and ... well, naked. Exposed. Vulnerable. And ugly. 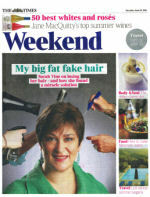 There I was, 44 female - and unmistakably balding. I’ve long had problems with my hair. But as a child it was thick and dark, heavy and long. People used to comment on how beautiful it was. I never gave it a second thought. Then, at the age of about 13, my parting began to widen. The first I knew of it was a boy at school mentioning it. I can’t even remember his name, but I remember that moment as clearly as if it were yesterday. I went home and examined the evidence. He was right. I asked my mum about it. She told me not to worry: only men lost their hair. It was not something that happened to teenage girls. Except that it did. Somewhere between that realisation and the end of university my hair went from normal to thin. People started to notice. It began to affect the way I felt about myself, to erode my already shaky self-confidence. I tried to avoid situations that might make it worse: all forms of sport, including the only one I was any good at, swimming (thin hair, wet: not a good look). Anywhere hot, such as a bar or a disco. Things that other people would get excited about, such as a ride in an open-topped car or a trip to the beach, filled me with anxiety. I made the best of it. The thinner it got the shorter I had it cut. It seemed to help: I could disguise the scant coverage more easily when it was short. After all, at the back and side my hair was normal, even thick. Only on top was the problem; just like my father. I went to see a dermatologist: I had male-pattern baldness (that was what they called it in those days. Now at least the profession has added the prefix “fe”, which helps). It was genetic, hormonally influenced and progressive. And there was nothing to be done. Stop worrying about it, he said. Try being less stressed and the problem might recede. Nice choice of words. I thought. How could I possibly stop being stressed about it? I was a girl and I was losing my hair. Hair is the thing when you’re a girl. Not having any, or not having enough, cut me out of half the female conversations going on around me. Not that the average Eighties hairstyle was much to be envious of, but I nevertheless felt left out, inadequate. Mostly, though, I was irritated with myself - for minding so much. It was stupid and vain and weak of me to care. So what if I had rubbish hair; I wasn’t dying of starvation, or cancer, or the big health scare of my generation, Aids. I wasn’t blind, or poor, or living in a war zone. What was thin hair compared to such horrors? I learnt to live with it. And it’s been all right, in the main. We’ve had our good times and our bad times, my hair and I. I’ve seen it come (during my two pregnancies it grew magnificently) and go (after both births it fell out to such an extent that I had to wear a headscarf to hide the damage). I’ve had some superb advice and help from some of the top names in the business of hair loss, and from my GP, who has always been incredibly supportive. When my thyroid packed up, the sides joined the top in thinning, and my eyebrows started falling out too. Fortunately medication resolved this last problem, but the side-shedding remained. Always, though, I felt that I was coping. I got used to it. It certainly never held me back. Until I saw that photo. I didn’t exactly cry (I don’t, much). But I did resolve to do something about it. Which is how, six weeks ago, I found myself sitting in a most unusual hair salon in West London, a lace mesh on my head and several lovely girls beavering away around me like magic elves, waving long curtains of hair. In the background, bustling around like a mother hen, the figure of Lucinda Ellery, the woman who changed my life. Ellery lost all her hair to alopecia at 10. She embarked on a lifetime of wig wearing: although some of her hair grew back, she never quite had enough to go it alone. As an alopecia sufferer at a time when such things were rarely spoken of, she did her best to hide her affliction. Wigs, she found, were woefully inadequate. It wasn’t only the danger of slippage and the general stigma attached to wearing them, it was also the depressing business of having to shave the hair underneath, and taking your hair off at night, something that no woman looks forward to. Driven by personal experience, and determined to find something better, she devised a complex “hair prosthesis” system. To begin with she used synthetic hair but over the years it has evolved into a sophisticated piece of engineering. Now she runs two specialist hair-loss salons, one in London and one in Manchester, and is on the verge of opening up in L.A. She caters for all kinds of loss, from Trichotillomania (or TMM, a nervous condition whereby the person compulsively pulls out his or her own hair) to women undergoing treatment for cancer, via alopecia and genetic conditions such as mine. She prides herself on being able to help everyone in one way or another. her particular area of interest is TMM, which is a condition that often effects very young girls. As a veteran hair-loss sufferer, simply being in her salon is a huge relief. Normally the process of getting my hair cut is a fraught one. It’s not just the embarrassment of exposing my hair when wet; it’s also the furtive looks from other customers and staff, and the general paranoid feeling that everyone is staring at my bald spot. Here, however, I belong. Every single person having their hair done, and quite a few of the staff, understands my problem. Here I am the norm, not the exception. The process is painstaking but actually quite simple. It varies according to the type of hair loss, but in my case a very fine mesh is placed over the area where my hair is at its sparsest. using a hook, all my own hair is pulled through the holes in the mesh. Then miniscule “connections” are forged by bonding tiny bunches of my hair to synthetic hair. The end result is several neat rows that hold the mesh securely in place. The mesh is then trimmed, and the business of hair replacement begins in earnest. Strips of human hair are sewn on to the mesh, gradually building up the thickness. The hair has been dyed to match my own colour and the design and fit have been carefully engineered to look as natural as possible. The effect is exhilarating. I giggle like a schoolgirl and get the staff to take snaps of me on my phone, which I email to all my friends - and, of course, my mother, who is delighted. The hair itself comes from Asia (it’s known as Indian temple hair). Ellery’s son Chris, who is in charge of technical development, explains that it is carefully sourced and heavily treated - pretty much the best on the market. There is one higher grade of hair, known as Russian Virgin hair, which is completely untreated, and therefore much finer and closer in texture to European hair. It’s harder to get hold of though, and he doesn’t have any in my colour. I don’t care. All that matters is that for the first time in 30 years I have thick hair. I takes the best part of the day to get all the hair in place, and then the lovely Kylie styles it. Having begin the day determined to stick to my short cut, I am now so giddy with excitement that I demand a full Cheryl. I want big hair, baby. Very gently Kylie explains that it’s always better to start small and to grow into a longer style, especially when you are starting out with the system. I acquiesce and she sets about razor-cutting it into an elegant crop. At this point you may have some questions. Does it hurt? Can you tell? Is it expensive? The answers are: no, no, and quite. My system cost about £1800 - but that includes all the design and hair and about 30 hours of labour. Once the system is in place it needs six-weekly visits to the salon to have it checked and adjusted (obviously as my own hair grows the mesh will become looser), and the entire thing has to be replaced about every two years. In between I simply wash and dry my hair as normal. I can swim in it, sleep in it, do whatever I want in it. I’ve even walked along Aberdeen beach in a force 10 gale in it. Comfort-wise, it’s a bit like wearing contact lenses: it takes a few days to get used to it, then you stop noticing.